The beautiful and beloved Bodhisattva (being of bodhi or enlightenment), Kuan Yin, is known by many different names in Asian cultures. Recognized as the Mother of Mercy and Compassion, like the Virgin Mary She is seen as an illuminator and intercessor. She is the epitome of mercy, kindness, love and compassion. She is known by different names some of which are: Kwun Yum (Hong Kong), Kannon (Japan), Guan-eum (Korea), Kuan Eim (Thailand) and Quan Am (Vietnam) but it is generally agreed that Her homeland is the Chinese island of P’u-t’o in the China Sea, partway to Japan. In Her stories over the centuries She has played many roles some of which are virgin, wife & mother, as well as a victim of child abuse, mutilation and murder. Through it all She has remained a source of power, generosity and compassion. When She at last reached enlightenment and could leave the pain and suffering of the cycle of birth, death and rebirth and enter nirvana, the perpetual state of bliss, She chose to stay in the world to aid, support and comfort all beings until each has reached enlightenment. Originally, according to Indian Buddhism, Kuan Yin was seen as incarnated as the male god, Avalokitesvara. But in 406 A.D. Kumarajiva, a monk and translator, first referred to Her as a female in his Chinese translation of the Lotus Sutra. 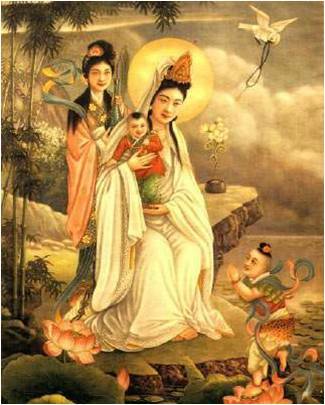 The concept of Kuan Yin manifesting as male, female, child and even as an animal is not contrary to Buddhist doctrine. 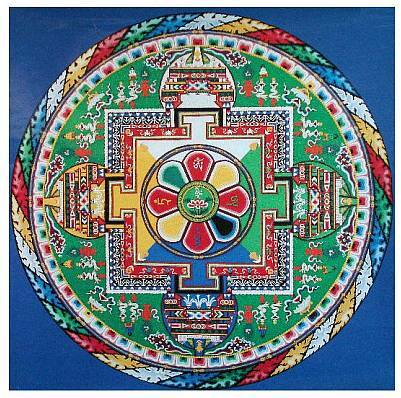 Scripture explains that a bodhisattva has the power to embody any form in order to help other beings. Kuan Yin usually manifests as a beautiful young woman dressed in white wearing or carrying the “Pearls of Illumination” and is often holding a vase from which She pours the “Water of Life”. Sometimes she holds a rice plant or a bowl of rice which symbolizes fertility and sustenance. The figure on Her crown is Avalokitesvara, Her previous male incarnation in Buddhism. She also is seen with or riding a dragon, often over turbulent water. The dragon symbolizes spirituality, wisdom, strength and powers of transformation. Her colors are those of the heart chakra, pink and green, and among Her gems are jade and pearls. Unlike many gods and goddesses, Kuan Yin is free of pride and vengefulness, askes for no sacrifices, and is reluctant to punish. She offers mercy and compassion to all who call upon Her with absolute sincerity. Even the act of speaking Her name is a powerful prayer. And powerful as thunder over water. There is nothing else so powerful. And Your blessings be infinite. In reverence, I bow my head. 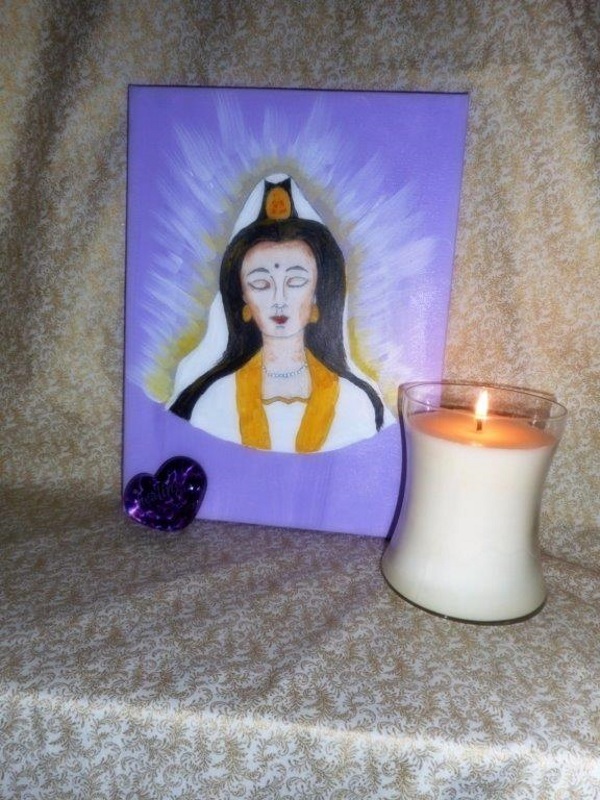 The following is a Ritual in honor of Kuan Yin’s great compassion. It is posted here with permission, and is from the Kuan Yin Oracle. Copyright 2010 Lighthouse Fengshui LLC. (though sitting cross legged will suffice). If your altar/shrine table is higher, that is okay too. Set up your altar with a picture or statue of Kuan Yin, the Mandala of Compassion (pictured below), and either a stick or cone of Lotus or Amber incense or other pleasant incense. 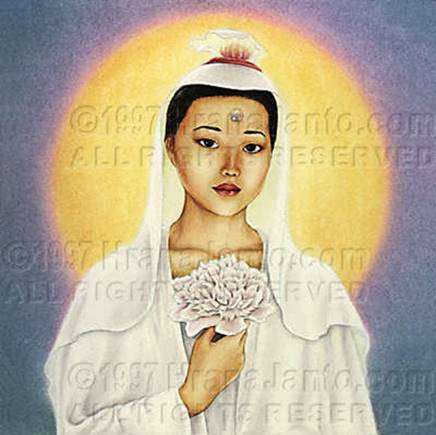 Offer one (or more) glass(es) of water which Kuan Yin will bless. Invite Kuan Yin to come to you and appear. Bring the palms of your hands together in the prayer mudra. 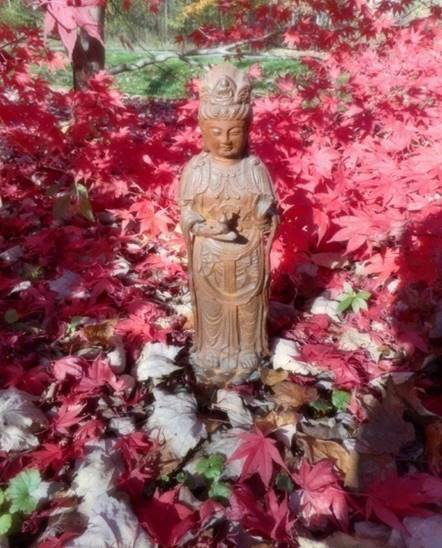 “May the Peace of Kuan Yin be upon this household. May the Light of Kuan Yin be in my soul. May the Wisdom of Kuan Yin be in my mind. May the Virtue and Purity of Kuan Yin be among the members of my household. 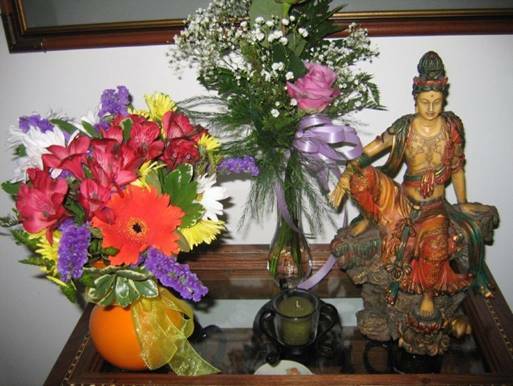 May the Grace of Kuan Yin be in my worship. 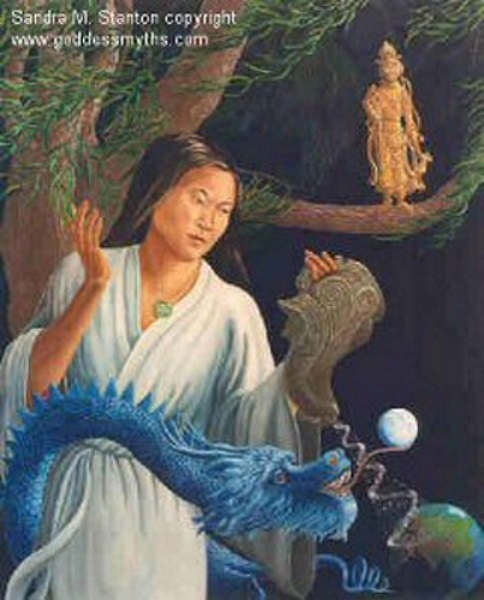 May the Talents and Genius of Kuan Yin be manifest through my senses. Finally drink the water blessed by Kuan Yin. This water now has healing powers.